Dear Readers, when it comes to the scent of flowers I am very particular. I find that jasmine is ok outdoors, but nauseating at close quarters. Lilies have a kind of waxy scent, redolent of decay, that doesn’t work for me either (plus the pollen is poisonous to cats). I adore freesias, but they have such short lives as cut flowers that I rarely buy them. But hyacinths have the kind of perfume that makes me want to inhale great lungfuls of perfume. For years, Dad would plant up pots full of hyacinth bulbs for forcing. In recent years, he hasn’t been well enough, so I’ve bought some ready-planted ones for him. When they’re finished, he asks the lady who looks after the garden to plant them outdoors, and so the borders are punctuated with blues and pinks and whites. The blooms are never as spectacular as in the first year, but they are still very fine, and on a still day they bring me up short with their delicious scent. 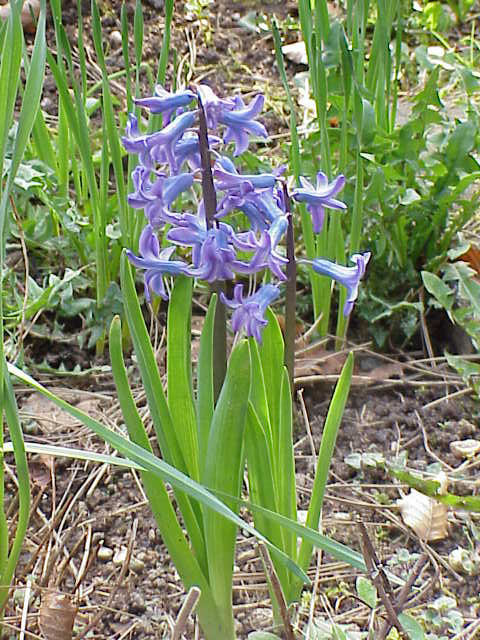 It seems as if the plants revert to their natural type in their later years, as seen in the photo of the hyacinth taken in the wild below. 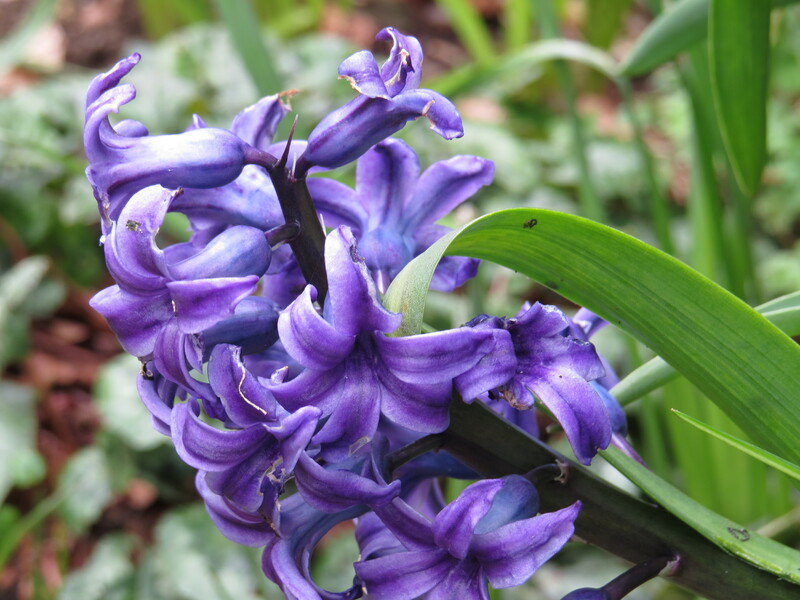 Hyacinths are native to the Eastern Mediterranean, and are members of the Scilla family. 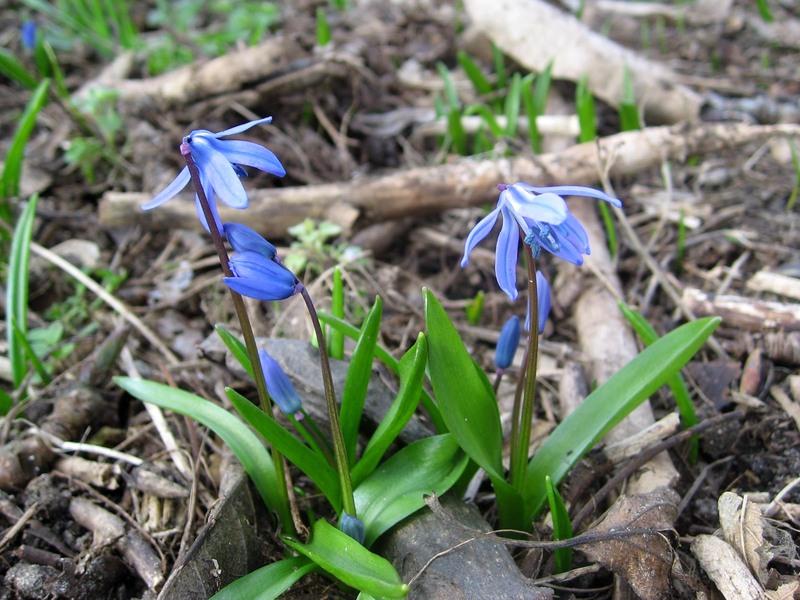 Most scillas are much smaller, more modest plants, although they can be startlingly blue. 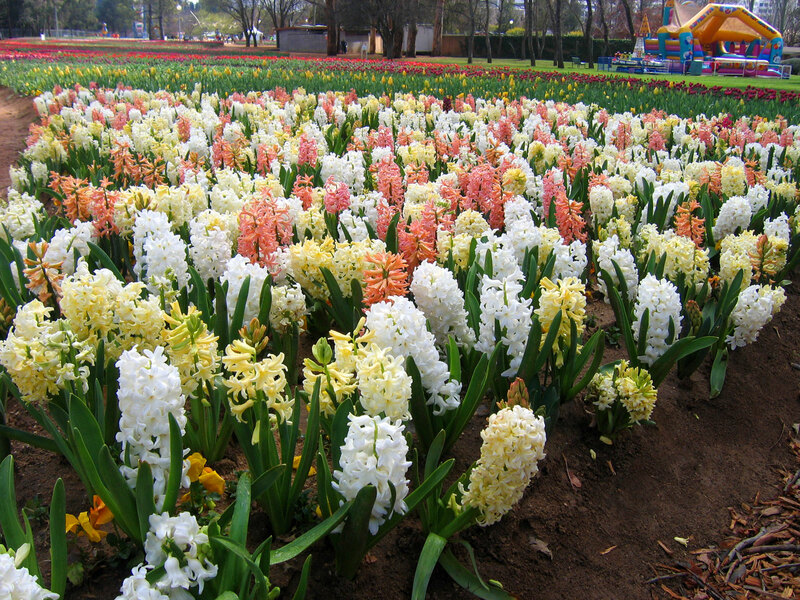 Hyacinths were introduced to Western Europe in the 16th Century and, as with all things bulb-related, the Dutch became masters of breeding different cultivars. In the wild, the flowers are largely blue, with occasional white and pink plants. By the 18th Century the Dutch had bred over 2000 different varieties, and the colours available now include yellow, orange, and apricot. 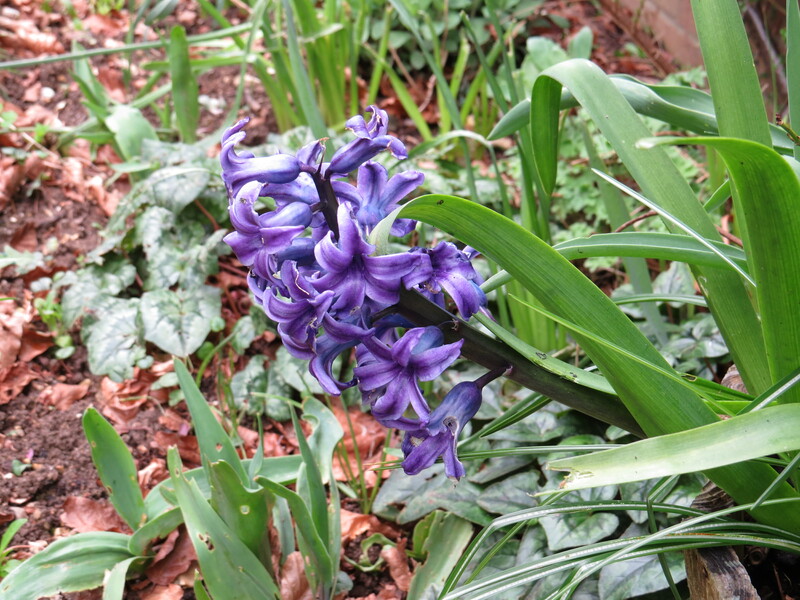 I definitely prefer the original blue hyacinth, and I think it has the most delightful scent of all, with the white-flowered hyacinth a close second. On the subject of blue hyacinths, the word ‘Persenche’ means ‘hyacinth-blue’, and is formed of 73% ultramarine, 9% red and 18% white. So now you know. You might expect a plant with such a strong scent to be attractive to parfumiers, and so it proved. Madame de Pompadour was an early advocate for the plant in France, and soon every titled lady was stuffing hyacinth flowers down her cleavage to surround herself with a sweet-smelling cloud. It takes 6000kg of hyacinth flowers to make a single litre of hyacinth perfume, and so it was a premium product until the days of synthetic perfumes. Strangely, as with freesias and bluebells, I have never found a convincing man-made scent that comes anywhere near the complexity of the flower. Well, it’s alright for some, that’s all I can say. All that the divine earth ever makes for me in such outdoor encounters is a fine selection of wood ants and irritated mosquitoes, but let’s draw a veil over the whole subject while there’s still time. In Greek mythology, Hyacinthus was a young man admired by both Apollo and the god Zephyr. Hyacinthus and Apollo were playing with a discus, rather like chaps play with a frisbee I suspect (although with fewer clothes). Zephyr was the god of the West Wind, and was disgruntled that Apollo was spending time with his favourite. When Apollo threw the discus, Zephyr blew it off course so that the unfortunate Hyacinthus was clunked on the noddle by a flying discus. Being beloved by the gods was something of a liability, I fear. A chastened Apollo created the hyacinth flower from the drops of blood shed by Hyacinthus, though there are only a few daffodils in the picture below, which means the artist missed an opportunity in my opinion. 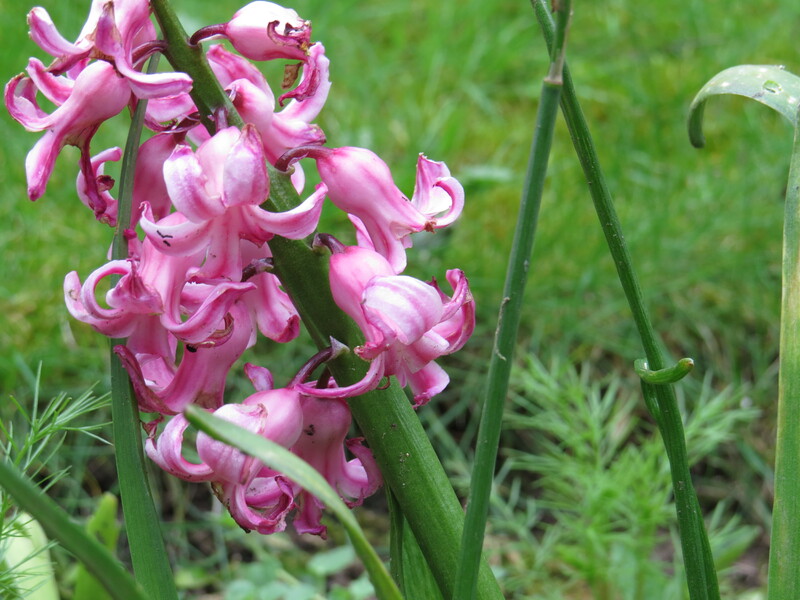 Hyacinth bulbs (rather than the leaves and flowers) are toxic, particularly to dogs if they dig the bulbs up and eat them. Most cats are much too sensible to eat a hyacinth. The big danger for humans is if the bulbs are mistaken for onions, but this is much less likely to happen than with daffodils, where the brown papery covering makes for a much closer appearance. 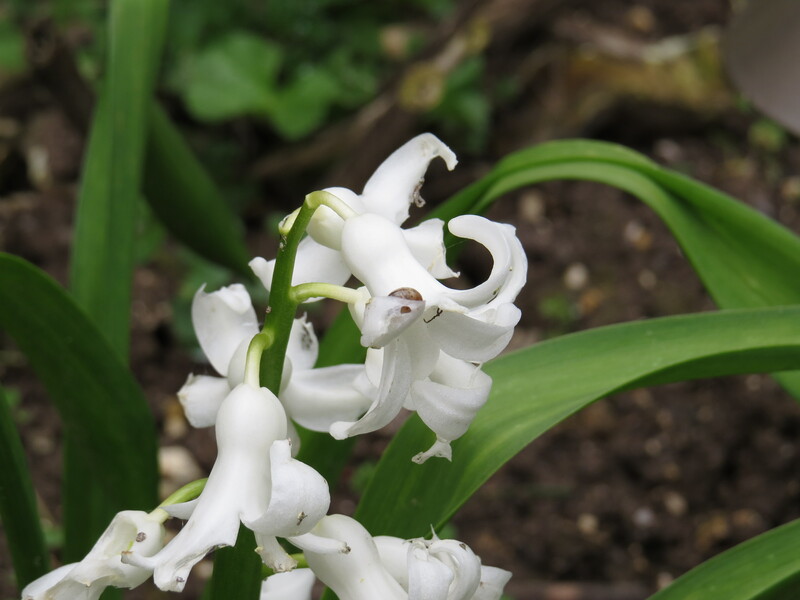 On the subject of hyacinth folklore, I find that in Shropshire it’s considered unlucky to have white hyacinths in the house, as they are emblematic of death. In the course of four years of preparing this blog, I have discovered that almost every plant that I write about is not allowed in the house for fear of someone dying. I suspect that often it’s because the flowers have featured at a funeral and are now inextricably linked with those sad memories. It seems a shame, though. Flowers, especially early-flowering ones like these, can bring such cheer in the early spring. 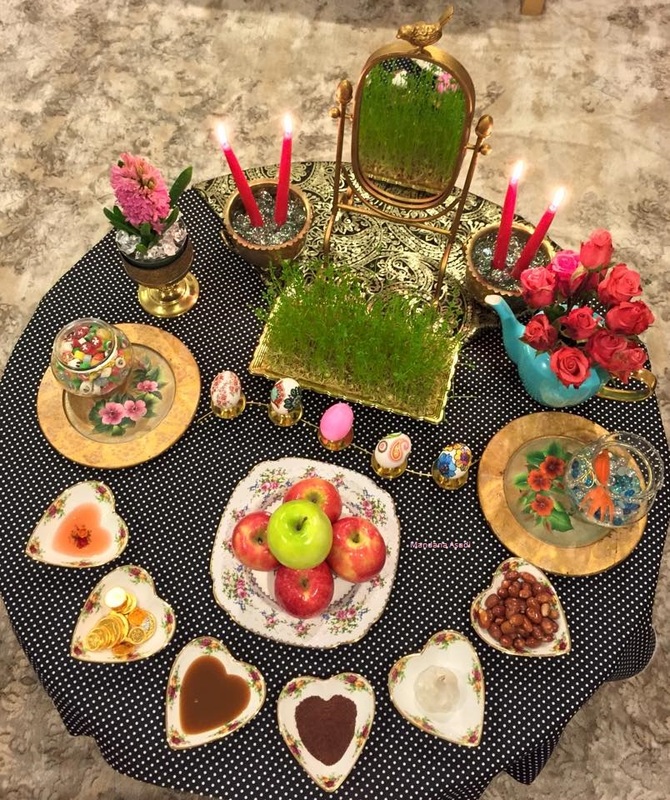 Other items include a holy book (usually the Quran), books of Persian poetry, candles, a goldfish in a bowl, decorated eggs for each member of the family and a mirror. Nowruz usually occurs on March 21st, the Vernal Equinox, and I can see how the hyacinth would add its beauty and scent to the occasion. 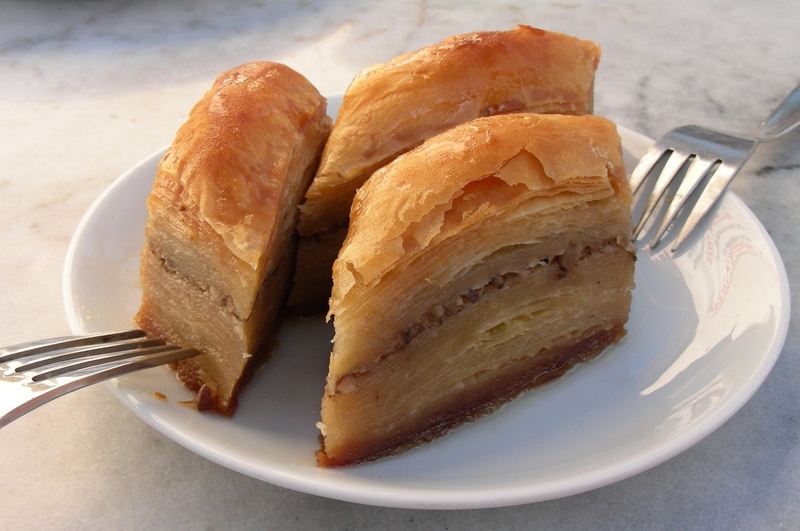 Plus, it’s an opportunity for baklava, the world’s sweetest dessert. As I watched the hyacinths earlier this week, I was delighted to see that, even though the flowers were almost finished they were still being visited by hairy-footed flower bees, particularly the males, who look as if they’ve been dabbed on the forehead with Tippex. I was also delighted to find out that hyacinth seeds are are dispersed by ants, in a delightful practice called myrmecochory. 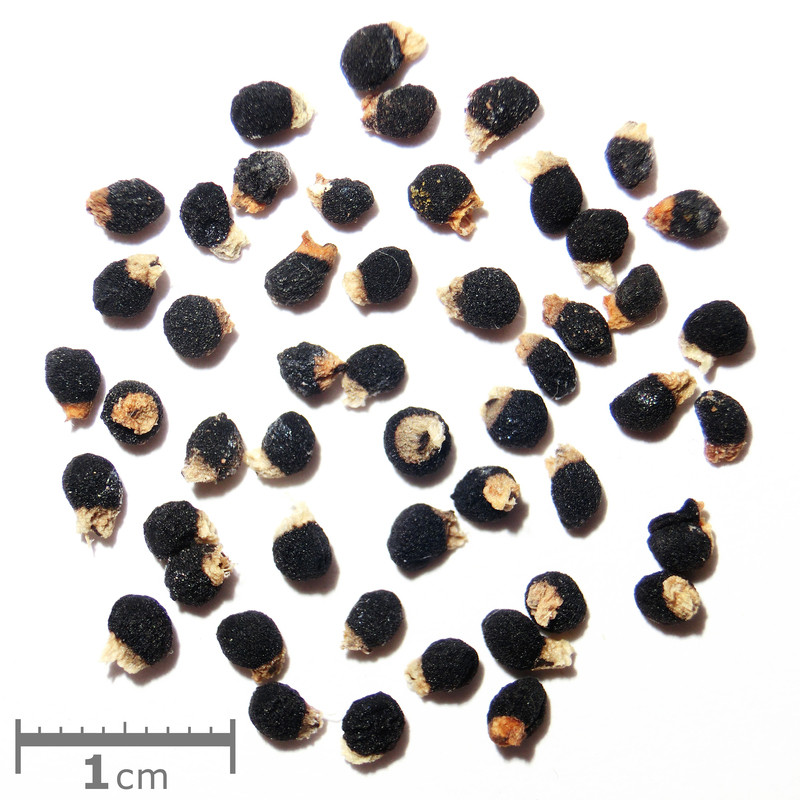 Hyacinth seeds are attached to a nutrient-rich outgrowth called an eliasome. The ants take the seeds back to their nests and eat the eliasome, but the seed is unharmed and either germinates in the midden of the ant nest, or is carried outside, where it can germinate away from its parent plant. I find it fascinating that this behaviour has evolved to the mutual benefit of ant and hyacinth, and it is much more widespread than I appreciated – over 3,000 species of plants rely on ants to distribute their seeds, and it is a major method of dispersal in both the South African fynbos (where it’s used by 1000 species of plant) and in many Australian habitats, both of which have largely infertile soils. Using an insect to carry the seed away from the parent plant (who might have just enough nutrients to survive itself) is one of those evolutionary marvels that makes my head spin. So, what is left to say about hyacinths? Like snowdrops and bluebells, they seem so hopeful, spilling their perfume into the cold air. I know, even now, that whenever I smell them I will see my father, tucking the white bulbs into the brown earth and popping them away in the shed for a few months, until it’s time to bring them out to brighten the last days of winter.The Persian poet Sadi (1184-1292 apparently, which would make him 106 years old) had this to say about the joy of hyacinths, and I agree. Feeding the soul is almost as important as feeding the body. This entry was posted in London Plants on April 18, 2018 by Bug Woman. Sadly, we do not grow them. They do not naturalize here without a good chill.